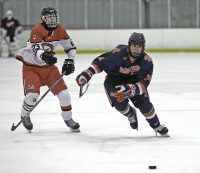 Jesse Rosenberg of Byram Hills pursues the puck in last Saturday’s 10-4 win over Fox Lane. The Byram Hills hockey team continued its drive toward the sectional playoffs by avenging an early-season loss to Fox Lane on Saturday afternoon. Ryan Cohen and Jesse Rosenberg each finished with a hat trick as the Bobcats skated to a convincing 10-4 victory over the Foxes in a game at Brewster Ice Arena that was delayed for nearly an hour due to an illegal goalie mask that caught the attention of the officials just before the opening faceoff. As a result of the late start, the periods were shortened to 15 minutes and there was no extended break for an ice cut before the start of the final period. The Bobcats, playing their second game in 24 hours that had a lengthy delay, jumped in front with two goals in the opening period and never looked back the rest of the way. Facing a Fox Lane team that they lost to on a last-minute goal back in December, the Bobcats jumped ahead 10 and a half minutes into the game when a shot by Rosenberg from near the left boards whizzed past goalie Daniel Rojas, whose mask had been the one that needed to be altered. Byram Hills took a two-goal lead with just 58 seconds left in the period as Cohen sent a wrist shot from the left point past Rojas. Less than three minutes into the second period, Cohen stuffed the puck into the back of the net from the right doorstep, giving Byram a 3-0 cushion. But the Foxes soon found themselves with a two-man advantage for over a minute. Daniel Leader, after two of his lefty slap shots were stopped, finally tipped a rebound past Bobcat goalie Ben Sfarra to get the Foxes on the scoreboard. But Sfarra, who finished the day with 28 saves, didn’t allow Fox Lane to score again on its long power play and just 70 seconds after the score by Leader it was Cohen again at the other end tormenting the Foxes. He tallied his third goal, enabling the Bobcats to regain their three-goal margin. The Bobcats soon added goals from Lucca Conigliaro and Rosenberg 31 seconds apart to build a 6-1 advantage. The Foxes’ Jared Goldstein got one back on a rush down the left wing with 3:50 to go in the second period, but just over a minute later Byram won a faceoff on a power play and moved the puck to Conigliaro, who beat Rojas with a shot from the left point. Goldstein scored on a rebound right in front of the net with 25.5 seconds left and the period ended with Byram Hills leading 7-3. The two teams exchanged breakaway goals in the opening moments of the third period, with Rosenberg completing his hat trick and then Leader scoring for the second time a minute later. The Bobcats added two more goals midway through the period to gain a large measure of revenge after their 4-3 loss to Fox Lane near the start of the season. The Foxes, meanwhile, desperately need to finish strong to have any shot of qualifying for the playoffs.